Don't worry, the astronomy is very easy. It's more like art than astronomy! On this day, a large cross will be in the sky and this is what it will “look” like at high noon from Izapa, Mexico, the birthplace of the Maya Long Count calendar. By the way, I should point out that this screenshot from my astronomy program makes it look like it's nighttime but that is only to allow us to see the stars and the planets, even though it is high noon. Unless it is cloudy, the sky will be blue and it will look like a normal winter solstice day with the sun only climbing to its lowest high noon position for the year. Yet this is a stunning image! This cross will be in the sky over the Maya with the sun virtually exactly in the middle of this cross. The Maya called this section of the sky “the sacred tree” and it is one of the most important motifs in their folklore. They symbolically carved the astronomy of the sacred tree in stone in their sacred ceremonial site in Izapa. This can only mean that it is extremely important! On this day at high noon, the sacred tree will be standing with its horizontal crossbar nice and level with Mars on the left and Mercury and Venus on the right. Not only will the sun be in the middle of this cross, it will be in the middle of the dark rift. The Maya considered the dark rift to be a special place of birth. Let's find out why. When we look into the region of the sky near the center of the galaxy, we see a large number of faint stars forming a big ball of lights. This section of the sky is quite striking; there is nothing else like it at all. It would have certainly captured the attention of the Maya, who easily saw it without a telescope night after night in the summer months. They considered this ball to be the pregnant belly of the mother of creation and the dark rift was seen as the birth canal. So when the sun goes through the middle of the birth canal, it can be said to be a type of solar rebirth. The Maya also celebrated the winter solstice as another type of solar rebirth because the length of the day starts to grow longer. And everyday the sun was said to be reborn at sunrise after it had been dead during the night. 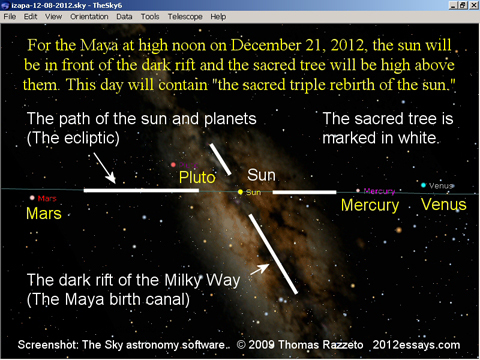 So December 21, 2012 contains a triple rebirth of the sun. I call these three rebirths the daily rebirth, the solstice rebirth and the galactic rebirth. A triple rebirth of the sun happens when all three rebirths occur on the same calendar day. This is obviously very important to the Maya because the astronomy of the triple rebirth is also symbolically carved in stone in the sacred ceremonial site in Izapa. But a triple rebirth of the sun actually happens year after year for many years around the time of 2012 until the solstice rebirth and the galactic rebirth start to happen on different days. This shift happens because of the slow wobble of the earth, which is called precession. 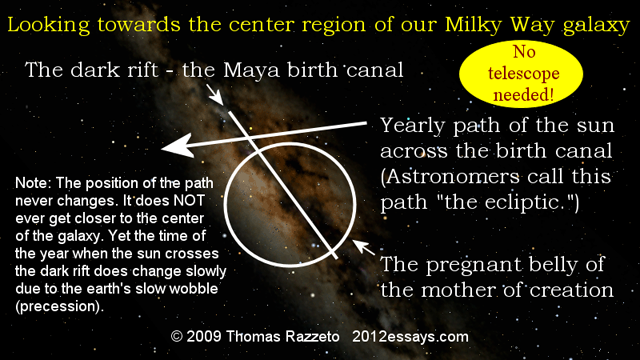 So of all the triple rebirths in the years around 2012, why did the Maya pick the one in 2012? It is my opinion that the Maya picked 2012 because of both the triple rebirth of the sun and the beautiful configuration of the sacred tree with Mars and Venus in balance around the sun. This combination is totally unique and will not even repeat again 26,000 years from now when the precessional cycle starts over again. This is a spectacular image and I think that the Maya knew that it would be like this. They intentionally set their calendar to restart on this exact day! Indeed, the calendar will be reborn on the same day that the sun will be reborn three times! And it is important to note that the Maya will be able to see Venus and Mercury before dawn and they will be able to see Mars just after sunset. So even though during the daytime they will only be able to see the sun and not the entire sacred tree, they will be able to see these important parts of the sacred tree at other times. By the way, this is not the peak of the “galactic alignment” of John Major Jenkins, which already peaked in 1998. John's a great guy and I really like some of his work but I don't think that the Maya missed what they were aiming at by 14 years, especially when I consider that they hit the exact day of the winter solstice from over 2,000 years away. It seems very unlikely that they hit the day they wanted and yet missed the year they wanted. For me, it is beyond a reasonable doubt that it is the astronomy that will unfold in the sky over the Maya on the exact day of the winter solstice of 2012 that is the focus of this calendar. Now, modern science says that this astronomy will not cause anything unusual to happen to us. We will not fall into a black hole nor will we be overwhelmed by a high level of cosmic rays. You may be surprised to hear me say this, but I think that the ancient Maya also held this exact same viewpoint. Nothing - except the astronomy - is being predicted by the calendar. Perhaps much later other shamans did overlay some predictions onto the calendar but I believe that the calendar was initially only linked to the astronomy. Yet it is extremely important to note that the ancient Maya are using this astronomy as the foundation of a very deep spiritual metaphor of rebirth. It is not being used literally as an alarm for danger or as a time marker for a sudden upward shift in human consciousness. In my opinion, the message of the calendar is metaphorical, not literal. Did Psychedelic Shamans Discovery a Mystical View of Reality? To better understand this metaphor of transformation and rebirth, we need to learn about the psychedelic experiences of the Maya shamans. Archaeological evidence indicates that people in Mesoamerica were using the psychedelic chemicals from the Bufo toad over 3,000 years ago. So this means that the shamans had over 1,000 years of psychedelic experiences before the calendar was put into use about 2,000 years ago. The stone carvings and statues of these toads in the sacred ceremonial site in Izapa can again only mean that these toads were extremely significant. I believe that these psychedelic experiences led the ancient Maya to a mystical understanding of reality and to a greater sense of self, and that this is the spiritual rebirth that they held as so important. By the way, the sacred ceremonial site in Izapa has the astronomy of the triple rebirth of the sun and it has the sacred tree. It also has the psychedelic toad. But what doesn't it have? It doesn't have any Long Count calendar dates! That right! When I found that out, I almost fell out of my chair! Although the general region of Izapa is the birthplace of the Long Count calendar, no dates were carved in the sacred ceremonial site. If the Maya wanted us to focus on the time of 2012, they most certainly would have included that date in the site. Indeed, with the intense focus that we find today on 2012, you would think that you could go to the heart of the birthplace of the calendar and find this date carved in stone, one hundred feet high! But instead, we don't find any Long Count dates at all! This seems to support what I am saying. The time of 2012 is not really important. It's the time when the astronomy arises, but that is all. In my opinion, you can only get to the bottom of 2012 by asking the deepest questions that we can ask as humans. Asking what is going to happen to us in 2012 is much too superficial. You have to ask: Who am I? Where did I come from? What is life? What is the true nature of reality? I think that the Maya personified the sun because you are like the sun. From our perspective on earth, the sun is born when it rises and it dies when it sets. But from a perspective out in space, we see that the sun is never born and it never dies; it is essentially eternal. Similarly, from the perspective of our ordinary understanding, it appears as if we are born and then later, we die. Yet is there a different perspective, a larger framework, that reveals that our true self, our fundamental unconstructed self, is indeed also without birth or death? Are we also eternal? At birth, you get an apparent identity. When you re-identify with your true self, you are reborn in the most profound way. Or perhaps I should say that you are “unborn” back to your eternal self! I think that the Maya used a timeless metaphor on purpose to help you understand that you, too, exist beyond the boundaries of time itself. You exist as pure awareness, and time, space, energy and matter are all created within you. This re-identification as pure awareness is the deepest and most fundamental rebirth that the Maya are talking about. Your eternal nature is looking out of your eyes right now, shining forever, just like the sun! Ponder this carefully!